Point McKay Dental offers NW Calgary Dental Bridges as a functional and aesthetically pleasing option for replacing missing teeth. 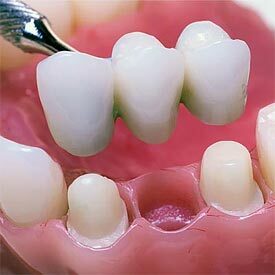 A dental bridge is a restorative dental treatment that is used to replace one or more missing teeth in the same area. These are many types of dental bridges available and the best option for you depends on your specific situation. Dr. Paul Hul will thoroughly examine your teeth to identify the best type of dental bridge for your situation. Dental Bridges are attached to the teeth on either side of the missing tooth [or teeth] which are called an abutment. The abutment teeth are shaped in order to accommodate the dental bridge and will look very similar to the size and shape of the original teeth. A pontic is fused in-between the abutments in order to replace the missing tooth or teeth in that area. We primarily use full porcelain dental bridges but these are cases whose a dental bridge can be made from gold, metal alloys, or a combination of these materials. After Dr. Paul Hul and his team will prepare your teeth, we will take an impression that is sent to our off-site dental lab for processing. To protect your teeth until your new dental bride is made, we will make a custom temporary bridge for you to wear. A Dental Bridge not only restores the function of your teeth, it also prevents the surrounding teeth from drifting out of position and into the space created by the missing teeth. We know that your smile is important to you and replacing missing teeth with our NW Calgary Dental Bridges is one of the many dental health services that we offer at Point McKay Dental. Call us at (403) 283-7829 to book your Dental Bridges Consultation with us today!